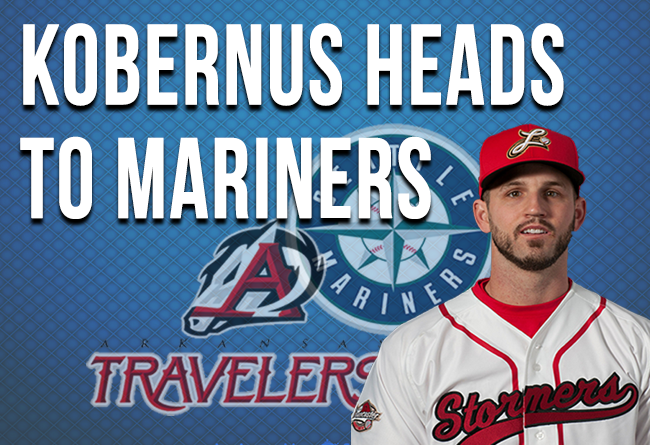 (Lancaster, Pa., May 18, 2017) - The Seattle Mariners have purchased the contract of Lancaster Barnstormers second baseman Jeff Kobernus, it was announced today. He will report to the Mariners Class AA affiliate in Arkansas. Kobernus, 28, was in his second season with the Barnstormers. The former Washington Nationals utility player carried a .310 batting average over seven games around missing three weeks with an injury. He had one double and two stolen bases. As the Lancaster second baseman in 2016, Kobernus batted .295 and stole 22 bases in 55 games. Drafted out of the University of California by the Nationals in 2009, Kobernus won two stolen base crowns (Class A Carolina League and Class AA Eastern League) on his climb through their system. He reached the Major Leagues in 2013 and spent a portion of two years at the big league level. Prior to coming to Lancaster, Kobernus spent the 2015 season with the San Francisco Giants’ minor league system.